She was visibly upset about the group quest change but I told her it’s probably a good thing. 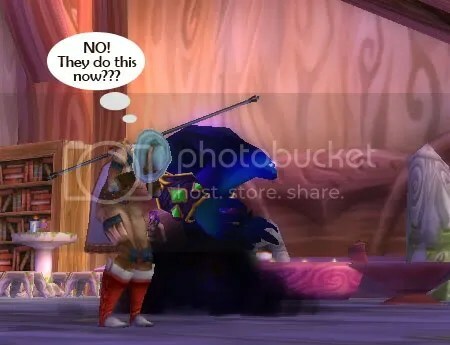 As soon as we can, we’ll go back to Northrend and see if maybe those group quest are still green. Might come in handy if she gets stuck in cata content again. And oh, it’s official now, servers really are different. On Zangarmarsh, Sally keeps having to log off and wait a few hours for nice people to leave the area. I mean a lot. Since reaching Mount Hyjal I can’t count the times she’s been buffed and there aren’t even many people around. She has to thank them, and then hurry away to remove it out of their view. Then of course she can’t go back without it can she, they’d see and wonder who that ungrateful warlock was. So yes, Virginia, there is a Santa Claus, it’s just that he lives on Zangarmarsh.